“Write me a story”… words sure to have schoolchildren chewing their pencils and staring into space as they wait for inspiration to strike. Not any longer for Year 5 and Year 6 pupils at The Grammar School at Leeds (GSAL) who, thanks to author and TV writer Ciaran Murtagh, now have a tried and tested method for creating ideas and developing a story. 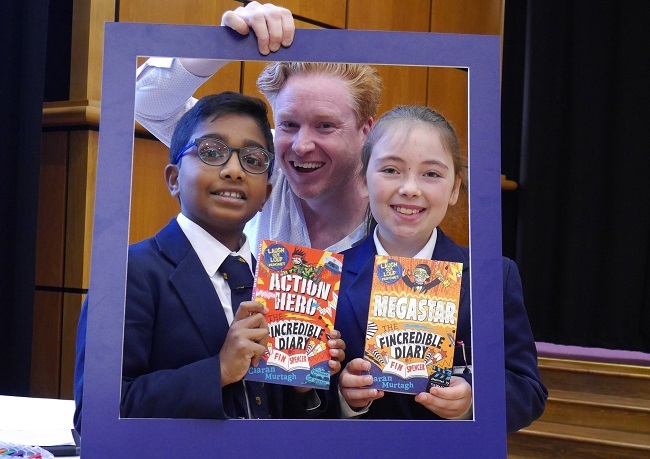 Ciaran, the author of 40 books and writer for many popular TV programmes for children, visited GSAL Junior School pupils to show them how what he does every day can help them with their writing tasks in school. In a highly entertaining session full of funny voices and visual gags, Ciaran had the children fully engrossed in the process of creating a story. He advised them where to start: “The title tells you stuff” and they came up with some title ideas by picking words from a page of the dictionary. Taking ideas from the audience, who chose the title and the genre and came up with some possible plots and the all-important ending (should it be happy or sad?) Ciaran told a story on the spot which – based on the audience vote – was a horror story with a sad ending. Ciaran is the author of the Dino series and Genie series as well as factual books for schools. His latest series is The Fincredible Diary of Fin Spencer.